You are at:Home»April»April 25»April 25, 799: Pope Leo III Attacked and Disfigured by Roman Christians! April 25, 799: Pope Leo III Attacked and Disfigured by Roman Christians! Although the ruffians succeeded in stabbing Leo’s eyes and cutting his tongue, Leo managed to escape the mob and later recovered his sight and did not lose his tongue. (The tongue and the gums are the fastest healing parts of the human body.) Leo was helped to go North across the Alps to seek refuge with Charlemagne, the man Leo later crowned Emperor of the Holy Roman Empire, much to the displeasure of the Byzantine branch of the Christian Church. 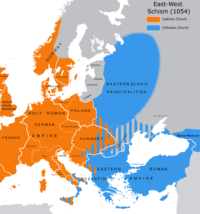 The disagreements between the Eastern and Western branches of the Catholic/Christian Church resulted in a schism (or split) in 1054, a rift that continues to this day despite some rapprochement. Charlemagne later came to Rome in 800 in support of Leo and his Papacy, and a grateful Leo crowned Charlemagne Emperor. Leo thus established a precedent that only the Pope could crown the Emperor. When Charlemagne died in 814, Leo was left without his protector, but managed to keep a step ahead of those that would do him harm and remained alive and in office while having a number of conspirators executed. Leo died not long afterwards in 816. Leo’s body was later placed in a tomb along with the remains of Leo I, Leo II, and Leo IV, though the remains of Leo I were later removed to a tomb of his own. Leo I was born in Italy around 750 and died at the age of 66 in 816 after serving as Pope for a 20 year reign. The thought of other Catholics attacking a reigning Pope and trying to poke out his eyes and cut off his tongue must seem bizarre to modern Catholics, and even to other people today, but the history of the Papacy is not a happy tale at all. Much fighting among pretenders to the throne of St. Peter had taken place, and at times rival Popes existed. Allegations of murder, conspiracy, sexual misconduct and all sorts of lurid stories surround the history of the Popes. This author is often amazed by the absolutely evil acts perpetrated by those that claim to be pious and religious people of all religions. What stories about brutal or particularly distasteful acts concerning religious leaders can you think of? Feel free to comment on this disturbing history and any specific cases you would like to cite. Norwich, John. Absolute Monarchs: A History of the Papacy. Random House, 2012. O’Malley, John. A History of the Popes: From Peter to the Present. Sheed & Ward, 2011. Next Article April 26, 1982: Mass Shootings/Killings Are Not Just in The United States!